Victory Belt Publishing, 9781628600681, 384pp. A quick flip through the pages of this elegantly designed cookbook will convince you that eating healthy, wholesome food doesn't mean that you have to sacrifice pleasure or flavor, and that making delicious food from scratch doesn't have to be complicated. In fact, you'll probably find that eating healthy is quite fun and rewarding Every recipe in the book is brilliantly illustrated, and the photos won't fail to make your mouth water. More than 150 grain-free, gluten-free, dairy-free recipes explained by a real person, in a real kitchen, using nothing but real, unprocessed food. Flavorful, quick, and easy everyday dishes that will please the entire family without requiring hours in the kitchen--from main dishes, such as Shepherd's Pie and Maple Balsamic Pulled Pork, to make-ahead sides and salads to last you all week, to yummy appetizers, including Sonia's unique take on Prosciutto e Melone, as well as several soul-warming soups and stocks. Easy recipes to help you stay away from junk-filled store-bought condiments, such as salad dressings, BBQ sauce, mayonnaise, and spice mixes. An entire section dedicated to homemade nut butters, complete with useful tips and a troubleshooting guide. You'll soon be making your very own nut butters at home, from the very basics, like raw cashew butter, to crazy-intricate flavor creations, like Smoky Bacon, Dark Chocolate, and Toasted Almond. Totally refined sugar-free desserts and indulgences that use nothing but natural sugars such as maple syrup, honey, and dried fruit. You will even learn how to make your own naturally sweetened chocolate chips. A 41-year-old single mother of two grown kids, Sonia Lacasse spent most of her life overweight, a heavy drinker, chain smoker, and food junkie. At the age of 35, she decided to turn things around and embrace a healthy lifestyle. Having struggled with her weight her entire life, she fell victim to the diet syndrome on many occasions and starved herself for months in order to lose the pounds. Sure, the weight would come off, but it was only be a matter of time before it all came back, because she didn't know how to feed her body properly and, more important, make it stick. She eventually started a blog, The Healthy Foodie, to keep herself accountable as well as keep track of the food she ate and the recipes she created. In doing so, she discovered that she has a real passion for food and that eating healthy, wholesome food in no way means that flavor or pleasure have to be sacrificed. Although Sonia initially meant for the blog to be nothing more than a personal online food diary, it soon became evident that her growing number of followers weren't just getting inspiration from her healthy recipes, but were actually trying them out. It wasn't long before she started receiving positive comments and emails on a regular basis from readers who had tried and liked her recipes, wanted to thank her for being an inspiration and for putting so much love and care into her blog, or simply wanted to tell her how much they enjoyed her mouthwatering photography. Before she could even realize it, the small seed that she'd planted had grown into a large and magnificent plant, and she eventually embraced a career as a full-time food blogger. It was only a matter of time before Sonia discovered the Paleo diet, which turned out to be a total liberation for her: no more calorie and macronutrient counting, no more eating small, unsatisfying meals at regular intervals, no more staying slightly hungry all the time, no more stepping on the scale every week and obsessing about that number...and out the window went her fat phobia! She felt a newfound liberty and felt much better physically, too. 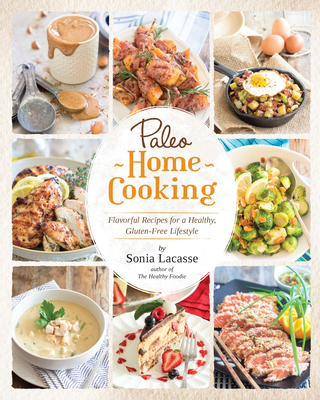 While many people find the Paleo lifestyle incredibly restrictive, it opened up a whole new world of possibilities for Sonia and made her feel super-inspired to come up with new, tasty, and, most important, healthy recipes. Luckily for you, she's all too happy to share them!